English/Arabic translation and localization of web sites, brochures, software. Middle East markets research. Arabic-English and English-Arabic machine translation and electronic dictionary products. English/Arabic translation and localization of web sites, brochures, manuals, and software. Translate legal and general documentation. Market research and analysis. Machine Translation software for the Desktop and the Web. Languages include Arabic, Persian/Farsi, Turkish, Korean, and Chinese. Software for Mac and windows, Arabic sms solution and Arabic pda support. Computer Aided Translation system with full-featured translation environment that uses current translation memory technology combined with example-based machine translation technology. Arabic publishing solutions, as well as QuarkXTensions, Arabic fonts, and other applications required in the publishing industry to enhance output, on both MAC and Windows platforms. Information about a rare prototype Atari computer that works in Arabic and English. Arabic related programming techniques using Delphi or other languages. It have some good Delphi tip, components, and links, plus some of authors screen savers and programs. Resources, downloads and commercial products supporting Arabic in several Unix and Linux implementations. Type Arabic with an easy-to-learn phonetic keyboard layout for Windows NT4/2000/XP or in the bi-directional applications of Windows 95/98/ME such as WordPad with the RichEdit 3.0 update, NoteTab, Outlook Express, Mozilla or Netscape 6. Online translation software based on Internet resources. Supports either single word translation or sentences translation. Other products are Magic Translator and Web Translator. MultiLing has a strategic alliance with STAR, one of the largest translation companies in the world. We market the TRANSIT and TermStar product family -- products that have redefined the very meaning of computer-assisted translation. Translation Center for Intranets with machine translation and online dictionary. Localization and translation services, including translation of audio-visual contents. Globalization solutions company offering multilingual translation software and translation services. An alternative to translation memory programs for freelance translators? Article published in Translation Journal about TM in general and this macro in particular. Following is a brief overview of the two technologies and an assessment of their usefulness in multilingual web-support systems. Translation and localization services company. Tool with translation memory and terminology management, as well as utilities for translation related tasks. Requires .Net 2.0. A machine translation offering to help companies remove language as a barrier to global communication and e-business. Links to writings mostly on Wordfast, by Andrei Gerasimov, published in Translation Journal and Multilingual Computing. A translation, localization, and language technology company based in the USA. Allied to the STAR group of translation companies. Four translation memory programs reviewed. If the business hours of Arabtrans Localization Services in may vary on holidays like Valentine’s Day, Washington’s Birthday, St. Patrick’s Day, Easter, Easter eve and Mother’s day. We display standard opening hours and price ranges in our profile site. We recommend to check out arabtrans.com/ for further information. 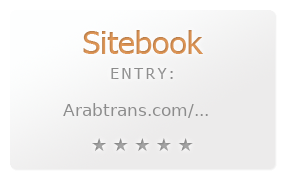 You can also search for Alternatives for arabtrans.com/ on our Review Site Sitebook.org All trademarks are the property of their respective owners. If we should delete this entry, please send us a short E-Mail.